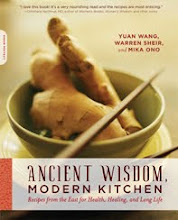 Ancient Wisdom, Modern Kitchen has gotten some more press recently, including mentions in Salt Lake City's March 2 Deseret News and in Los Angeles Magazine 's LAmag.com "Reading List." Also look out for upcoming coverage of the book in Clean Eating Magazine and Energy Times . And the fun will continue... Tune in for radio interviews with Ancient Wisdom, Modern Kitchen authors on North Carolina's Paradise Network on Wednesday, March 10 at 9:40 to 10 AM (Eastern time), Wisconsin Public Radio's "Here on Earth" on Friday, March 12 at 3 to 4 PM (Central time), and Marin County's KWMR Radio "Pleasures in Taste" on Tuesday, March 16 at 9:30 AM (Pacific time). Wish us luck!